The 2017 twinner exchange was a small anniversary: it was already the fifth round of the program. 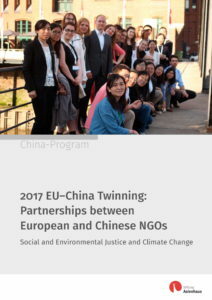 The report “2017 EU-China Twinning: Partnerships between European and Chinese NGOs” illustrates the outcomes, challenges and lessons last year’s exchange taught. It furthermore highlights the importance of well-established Sino-European relations – especially in the fields of social and environmental justice and climate change. Some of the participants already started to develop follow-up cooperation with their partners. You can download the full report here. Posted in: Full Twinning Reports, Publications, Publications 2017, Twinning News 2018.